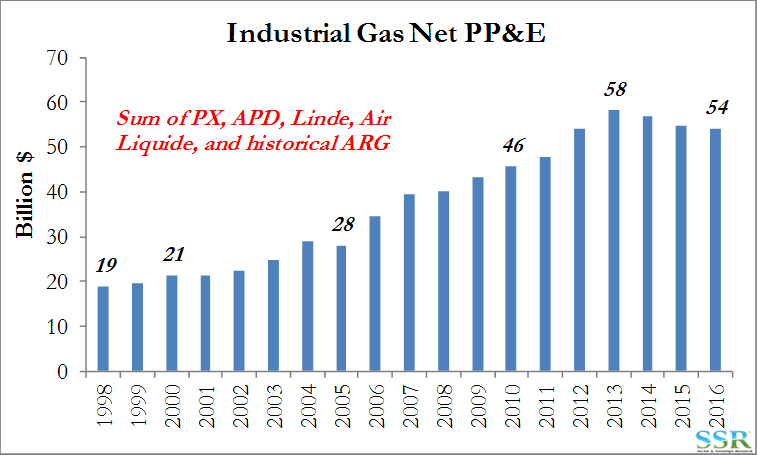 The PX/Linde merger is likely to be a positive for new consumers of gas once the deal is complete and it is potentially bad news for Air Liquide and APD for the same reason. Our analysis suggests that PX/Linde should take share in the “new business” side of industrial gases because the combination should create the lowest cost supplier of most sized air separation and other industrial gas facilities. PX is strong where Linde is weaker and vice versa. The combined company should be best in class at everything, and as much as $9-10 per PX share of 2020 earnings is possible with synergies and new capex share gain. 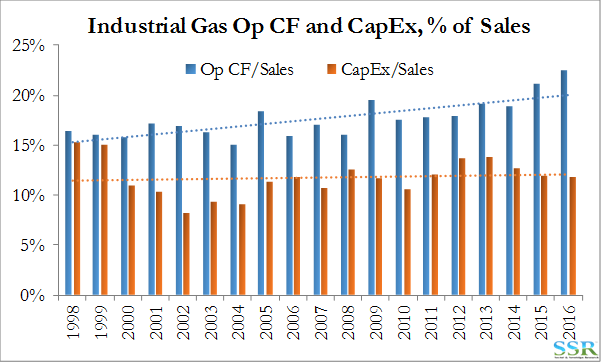 There is more capital at the industrial gas companies than projects today and if the combined PX/LIN is able to take share based on costs, Air Liquide and APD will lose out. They will be faced with either much lower capex and growth or they will be forced to compete at a lower return and margins/returns/earnings growth will suffer as a result. The beneficiary will be the consumer of the gas, who should be able to get lower priced long term gas supply as a result. Post merger, and even with substantial divestments (to satisfy the regulators), PX/LIN should have enough operating free cash flow (more than $7bn) to allow the company to fund all the new projects likely available to PX/LIN, APD and Air Liquide. Capex for the 4 majors has fallen from almost 70% of free cash flow in 2000 to 52% in 2016 in part because of rising returns and in part because of lower capital opportunities. 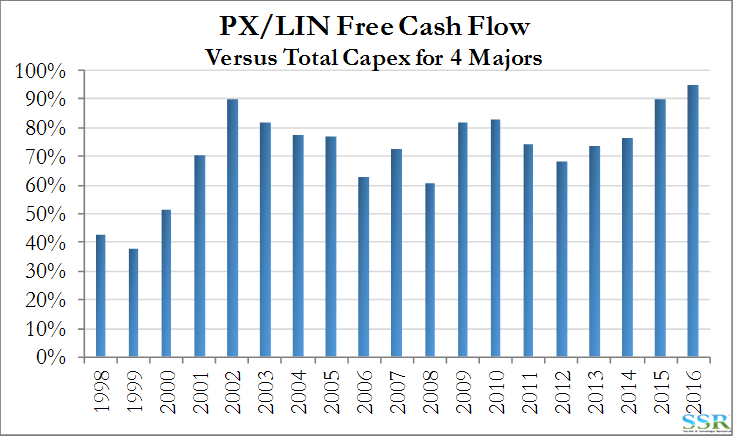 We estimate that 2016 overall Capex for the 4 majors would be around 85% of free cash flow for PX/LIN once synergies have been achieved – spending at this rate of FCF was common in the 1990s before costs were “right-sized” and margins improved. Equally interesting for the new entity is the amount of shares the company will likely be able to buy back with the proceeds from the combined divestments required. Conservatively, $3bn of (sales) divested should raise $7bn of proceeds before tax. This could be used either to fund further capex or buyback more than 7.5% of the stock. Shares of PX and LIN have done well since the merger talks became public – longer-term there is further to go. Near-term, multiples are very high and the deals is a long way off. We are concerned for APD short term as multiples are very high and the story is less clear – we are neutral on Air Liquide – gains from the Airgas deal could be offset by PX/LIN. In prior research, we have talked about the underlying slower growth in the Industrial Gas markets this decade versus last. Even with a spirited recovery in US manufacturing we do not believe that opportunities to deploy more capital profitably will increase materially. Any US recovery can be met through existing overcapacity in the US and the plants that Air Liquide (Airgas) is likely to build; opportunities for others to build air separation facilities or HyCo units in the US will be limited – however, we would still expect PX/LIN to will win the lion’s share of any opportunities. As shown in Exhibit 2 – free cash for the industry is growing faster than Capex. This was not true 15 years ago when all were able to deploy available cash and incremental borrowing at good rates of return. PX became very focused through the last decade on modularizing plant design, taking the view that one of the drivers of competitive success was going to be the ability to build cheaply. It is one of the reasons why PX was able to show better return on capital trends that the rest of the group through the 2000s. Linde, with an already rich engineering history has mastered the other end of the scale – the larger more complex HyCo technology and large scale air separation units. PX/LIN takes share of new business, and is able to deploy cash at high returns – APD and Air Liquide have more limited or more risky capital deployment opportunities and lose share as well as margins, returns and earnings growth. We are already seeing APD focus outside the US – mainly in China, where returns are less certain and “take or pay” contracts more challenging to enforce in the case of customer shutdowns. APD is also talking about going off-piste with equity in gasification investments. APD, Air Liquide and others bid projects away from PX/LIN buy undercutting and accepting returns closer to their cost of capital than historic norms. We would expect PX/LIN to outperform in this case but all will see slower earnings growth and the risk of sector multiple contraction that we have been writing about for the several years re-emerges. PX/LIN Cash would be redeployed in dividend increases and share buyback most likely. PX/LIN accept only the highest return projects – under-deploying capital, allowing APD and Air Liquide to do better – and PX/LIN maintain a steady buy-back and dividend increase policy. This should also allow PX/LIN to outperform, but growth might be slower, and the story less compelling than in the first case. Net PP&E for the majors peaked in 2013 – Exhibit 3 – and we would only expect it to rise slowly from current levels unless we see some off-piste moves as have been suggested by APD, in terms of moving towards ownership of the gasification units in China or more direct investment in ammonia as a derivative of syngas. 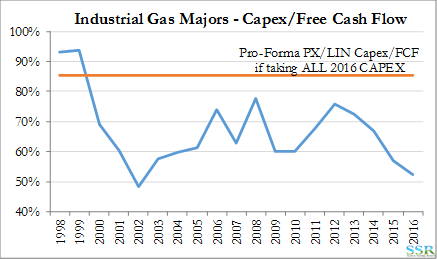 Building on the analysis suggested in Exhibit 1 we show PX and Linde’s combined free cash flow as a proportion of Capex for all the majors. In Exhibit 1 we based our analysis on losing some free cash flow because of divested assets but we have also assumed $1.4 billion of synergies adding to free cash flow. Exhibit 4 shows a rising trend, but it would also show a rising trend for APD and Air Liquide as overall Capex is falling and costs are falling – so margins are rising. The point we are making in this piece is that if PX and Linde, once combined, can offer a lower cost of build in most geographies and for most size and scope of projects, the company could in theory take the lion’s share of new business. If PX/LIN could deploy $5bn a year with a 15% return on capital the company could deliver 18% EBIT growth versus 2016, before any deal synergies (which we estimate could be worth another 25-30%). This capital deployment could still leave well in excess of $3bn annually in terms of surplus free cash and incremental borrowing capacity to fund maintenance capex, dividend (currently around $1.6 billion), and share buybacks. The rough math assumes rational capital decisions from both APD and Air Liquide. If the deal does not go through PX does not have much of a story and looks expensive based on current EPS projections.